Racing 92 will be boosted by the return of fly-half Finn Russell for their Champions Cup quarter-final with Toulouse. The Scotland international has not played since his influential role during his side's Six Nations comeback against England at Twickenham. Toulouse welcome back France pair Yoann Huget and Romain Ntamack in the backs. Ntamack returns to inside centre after starting the last three matches at fly-half for his country. Can Russell end Racing's European misery? Despite boasting a carefully selected crop of international superstars in recent years, Racing 92 have never achieved their most prized ambition of winning the European Cup. Dan Carter and Johnny Sexton have both tried and failed, so the mantle now falls to Scotland's Russell. 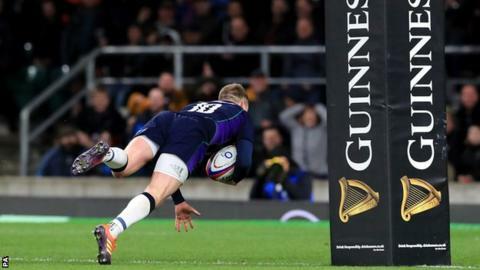 The 26-year-old's performance at Twickenham saw him hailed as "the best number 10 in the world" by former England winger Ugo Monye, as Russell scored nine of Scotland's 38 points to secure a draw that came despite trailing 31-7 at half-time. Four-time winners Toulouse, meanwhile, currently lead the Top 14 table with a fluid style of play that contrasts the French national team's stuttering form. Racing were the beaten finalists last season, going down 15-12 to Leinster in Bilbao, and Toulouse assistant coach Jean Bouilhou highlighted possession as likely key when the two teams meet in Paris. "I think it'll be key to keep possession and not give it away to our opponents, because Racing are so strong on home soil," said Bouilhou, who won three European Cups as a player with Toulouse. "They're a team who play differently, depending on whether they're at home or away, and they have world-class players, so we know it'll be a very tough game."